Even the back of the building can be charming. 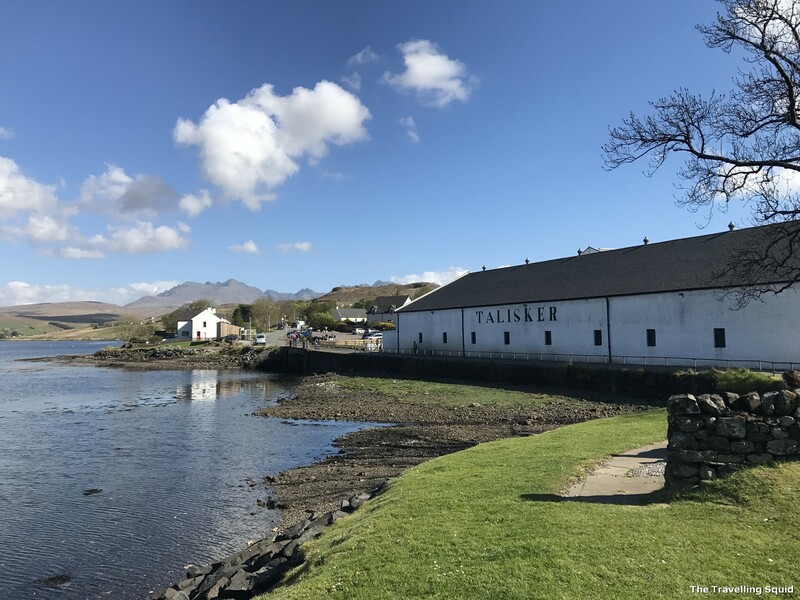 If you’re visiting Isle of Skye, a visit to the Talisker Distillery could be on the cards, especially if you have not visited whisky distilleries during your trip. 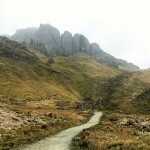 The main takeaway from our journey was that the area surrounding the Talisker Distillery was very beautiful. It faced the Loch Harport, of which I assume water from the loch goes into making of the whisky. 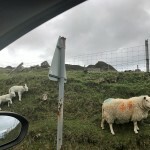 We parked right behind the distillery and were greeted by the bleating of sheep as soon as we stepped out of the car. It turns out that there were several farmhouses in the vicinity. I could see little lambs grazing on the bright green slopes. 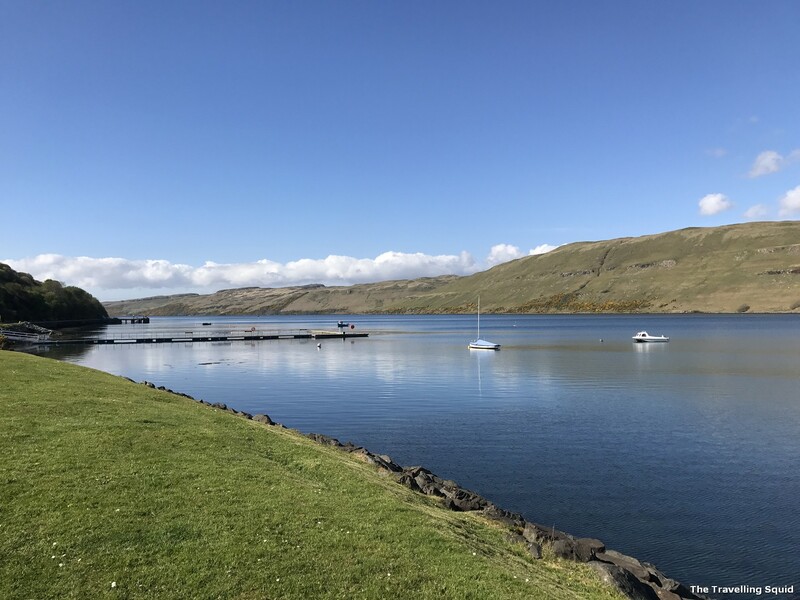 The Talisker distillery faces the beautiful Loch Harport. 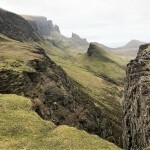 We drove to Carbost from Portree, the biggest town in Isle of Skye. It took us less than 30 minutes. Do note that driving there involves several one lane roads with passing places. I’m guessing, not that many people drive to the Talisker Distillery in Carbost Isle of Skye. The big groups come in tour buses, or shared transportation. There were surprising many more people at the distillery, in comparison with the number of cars driving in. As shared in an earlier post, if you have visited one of the Diageo distilleries, chances are the tour is going to be similar. 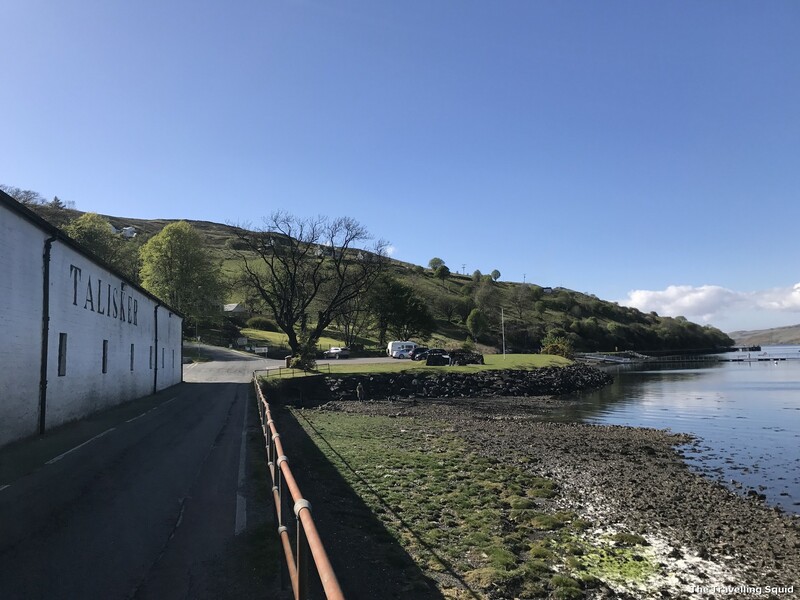 If you’re deciding between visiting the Talisker or Oban distillery, this article might come in helpful too. Fancy a bottle back? Like Oban, you get $5 off if you go on a tour. 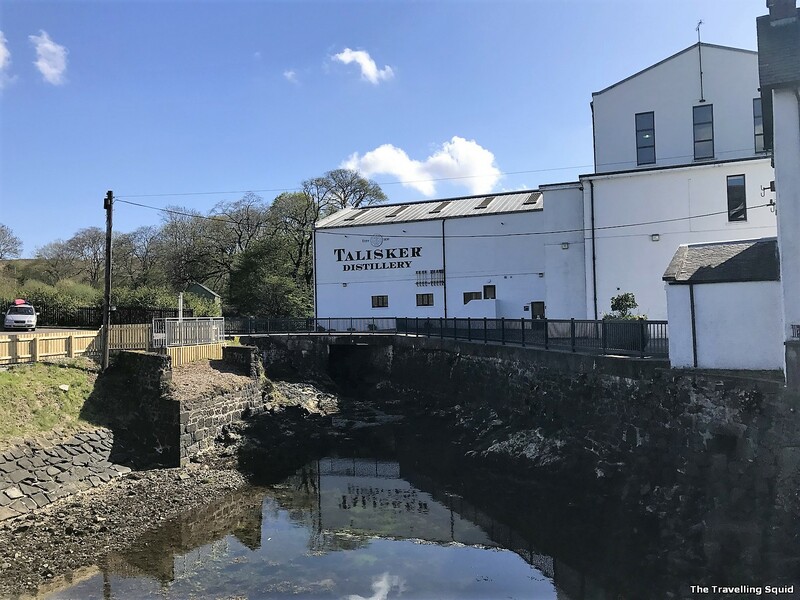 The Talisker Distillery is similar to the one in Oban, only that it is somewhat bigger. It has two copper stills instead of three. 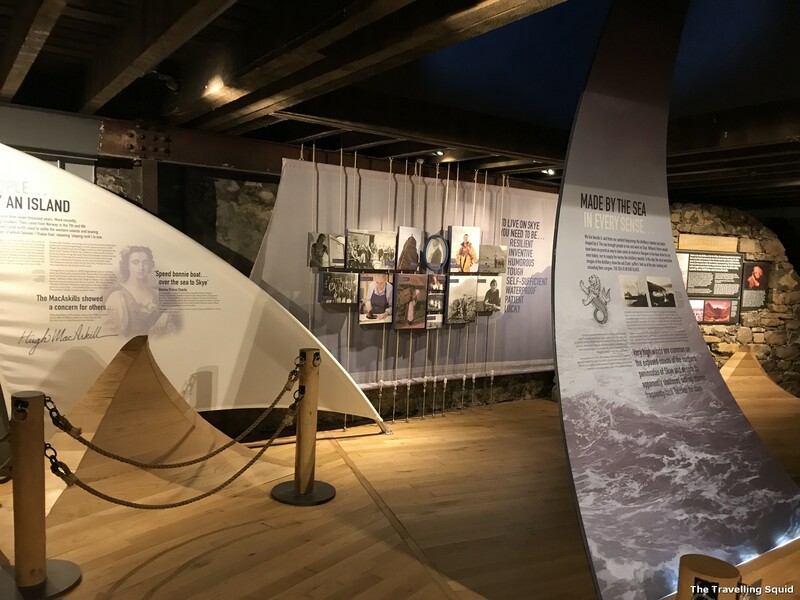 Unlike the Oban distillery which is located in the middle of town, it has warehouse space on-site to store the bottles of whisky. For more on how the tour will go, you can refer to the Oban post. Whisky bottles on shelves, like trophies. The exhibition area is quite large too. 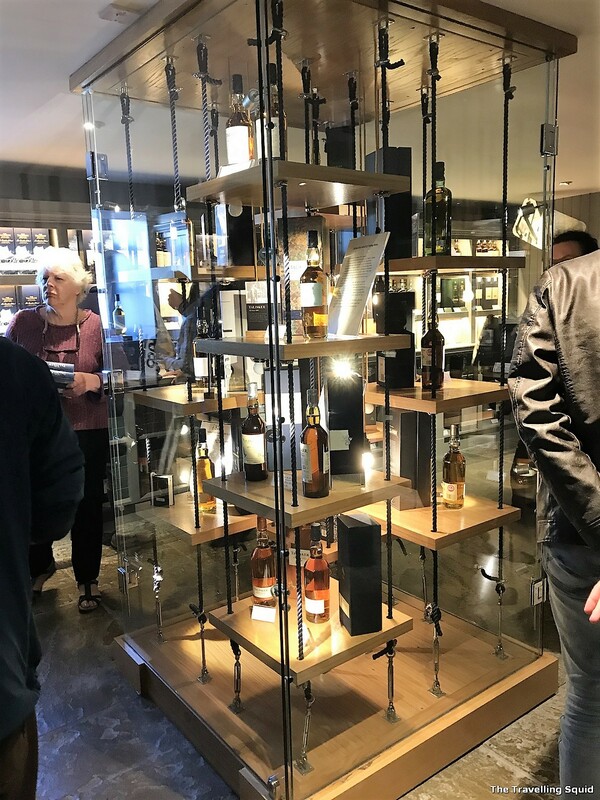 The bottles of whisky were placed on shelves, with spotlights adorning them with light, like trophies. At the distiller, you can find other Diageo whiskies such as Carl Ila. The bottle is also the same. Similar to Oban, you get £5 off a 750ml bottle if you pay £20 for the guided tour. 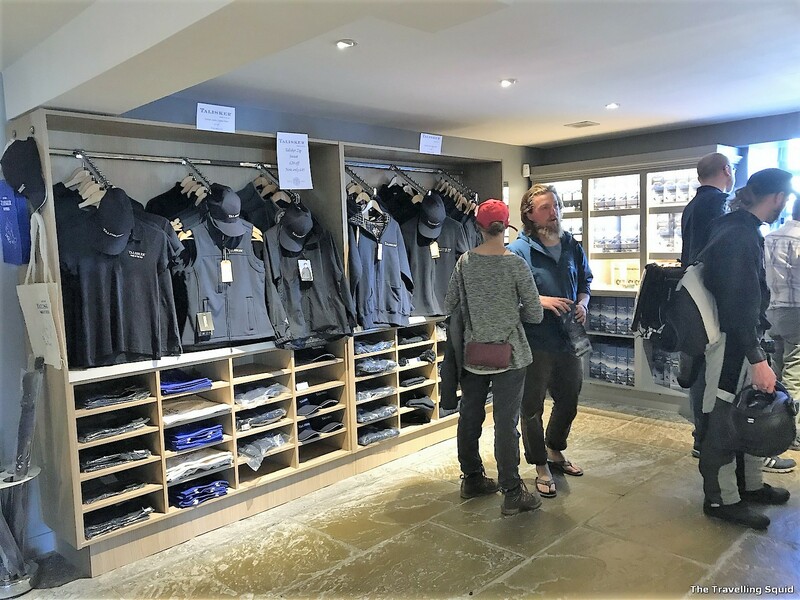 Merchandise – I thought there were a lot more things to be bought here, than Oban. There are even T-shirts and jackets! It’s like a football club. 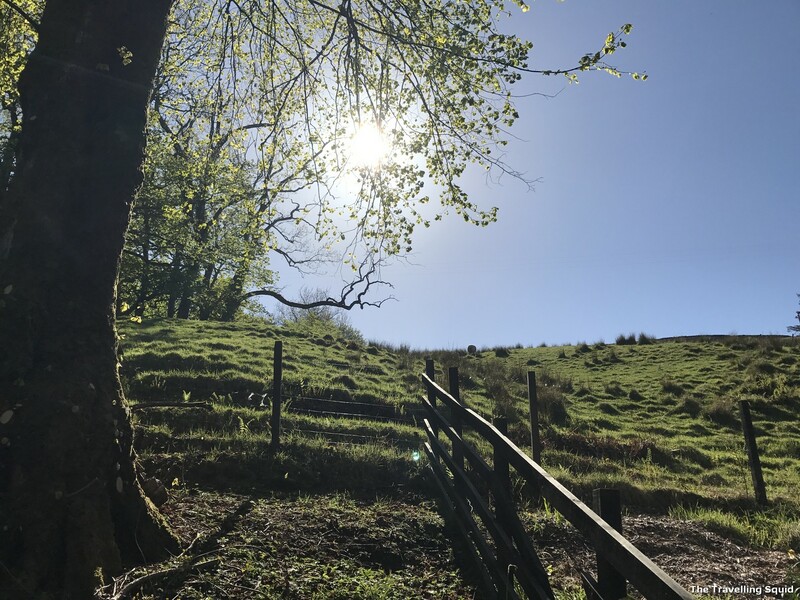 The area was surrounded by greenery, most of them grazing pastures for the bleating lambs. 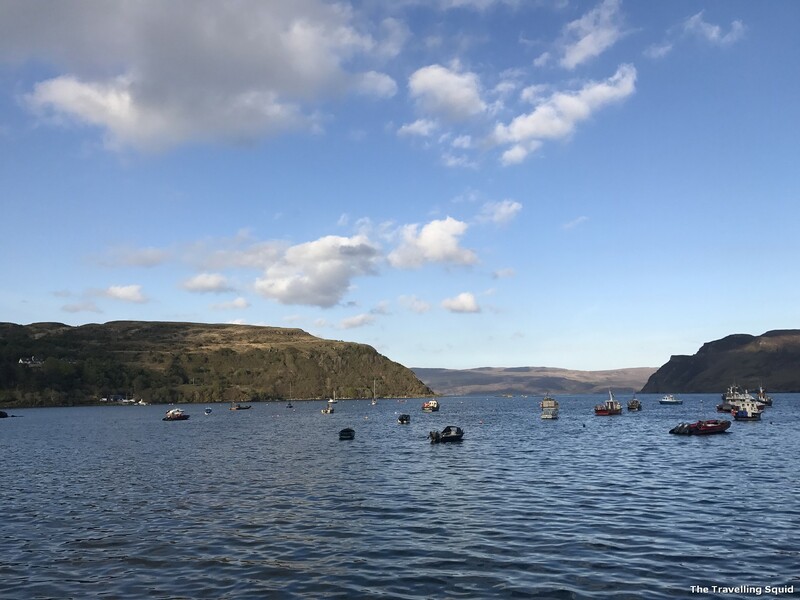 It faces the Loch Harport, which is serene, and beautiful especially in the face of the brooding, white Talisker building. A sense of calmness descends upon you, and it’s not the effect of the whisky. There’s no other attractions in the vicinity, apart from The Oyster Shed (a place which sells oysters). 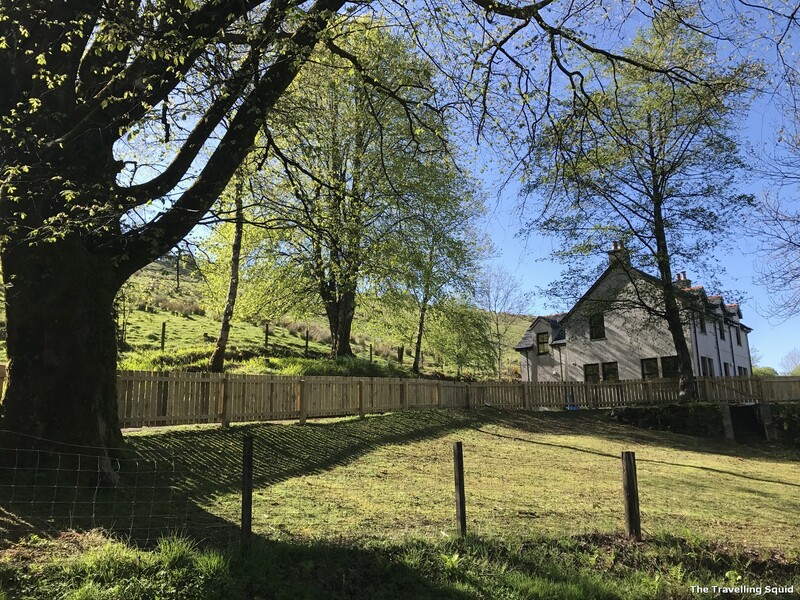 According to Tripadvisor, it’s a one minute drive uphill from the Talisker Distiller – it is with deep regret that we failed to check out this place. The bleating lambs have gone into hiding. 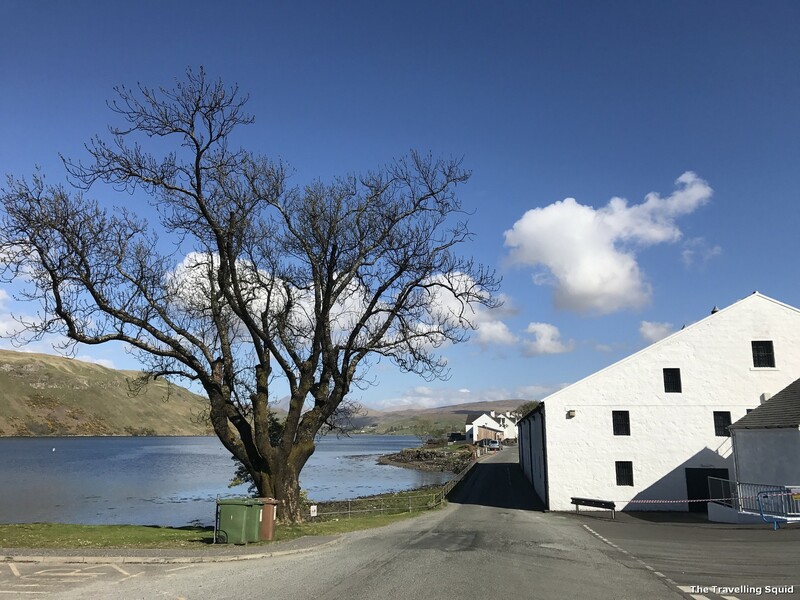 I think a visit to the Talisker Distillery in Carbost Isle of Skye is worth a trip especially in the spring and summer months, where there is plenty of daylight and the surrounding areas glow with live and energy. 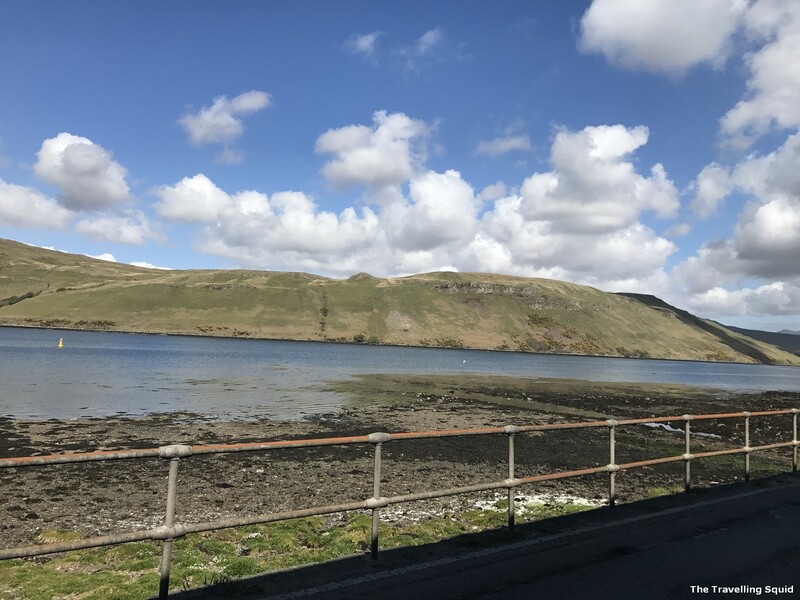 Lucky for us, it was bright and sunny, and the Loch Harport was very beautiful. What an accurate reflection of the scenery, on the box. 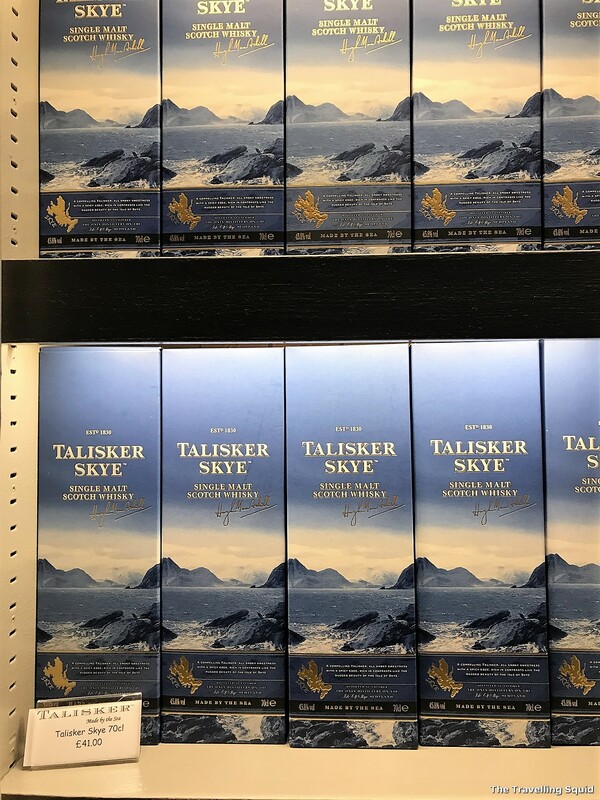 As a single malt, Talisker was a tad strong for me. But it has a nice smoky flavour once you open it up with droplets of water. If you are driving, a wee dram is just about enough. You need to have a clear mind especially when navigating through the one lane roads with the passing places. Have some oysters at The Oyster Shed before you go! 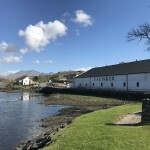 The Talisker distillery – it’s beautiful I must say. 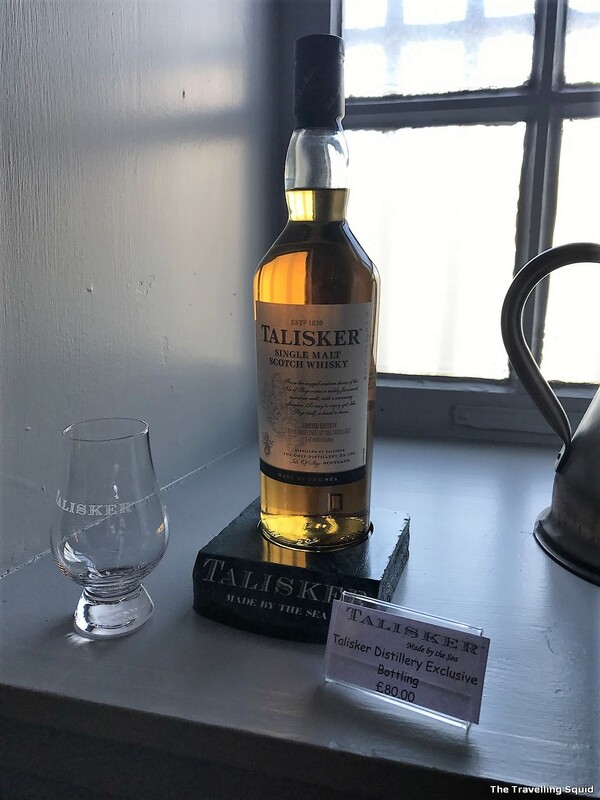 Have you been to Talisker and The Oyster Shed? If so, do drop a comment in the box below!